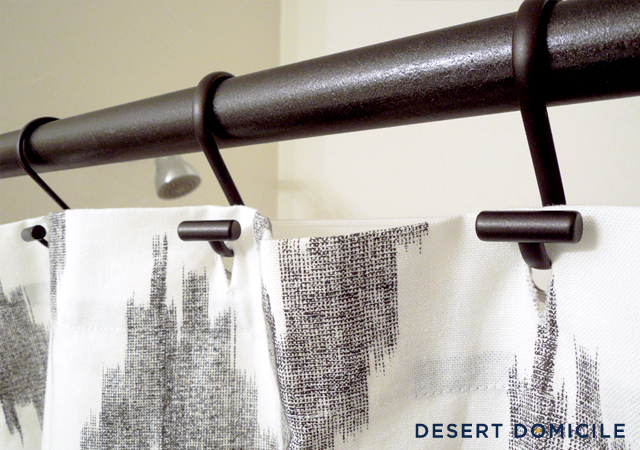 Our guest bathroom's curtain rod has been updated! Click here to see how it currently looks! I figured it was time to replace the builder basic shower curtain rod in our guest bathroom. Rather than buying one, I decided to DIY one since the rod I wanted isn't what you'd typically find in a big box store. Yep, you guessed it! 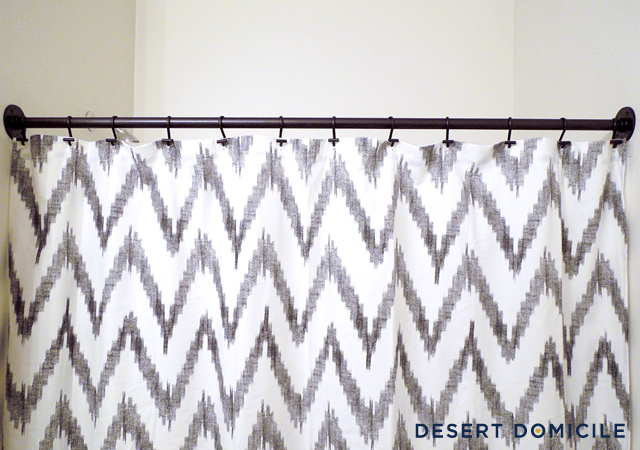 I DIY'd a pipe shower curtain rod! 1. Head to your local home improvement store of choice (mine was Lowe's) and buy the following: 2 floor flanges (I bought 3/4" galvanized ones), and a piece of pipe in your desired dimension. I bought a 3/4" x 60" black iron pipe that I had cut down and threaded (for free!) to 58" because that's how wide the opening of my shower is. While you're at the store, don't forget to buy spray paint or screws (to mount the rod with) if you don't have any at home! 2. Remove any stickers from your pipe and clean the sticky residue off with Goo Gone or your preferred cleaner of choice. 3. Set up a spray paint station. 5. Let everything dry for the amount of time the spray paint can specifies. My can said the paint would be dry to the touch in 30 minutes and fully cured in 24 hours so I let everything dry overnight. 6. 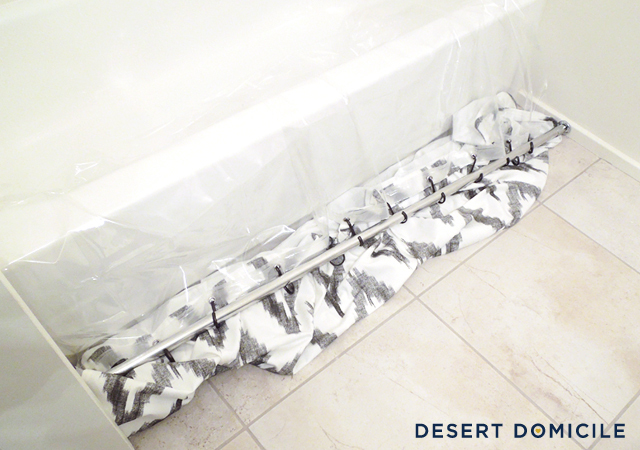 After everything is dry, determine where you want your rod to be hung on the wall. 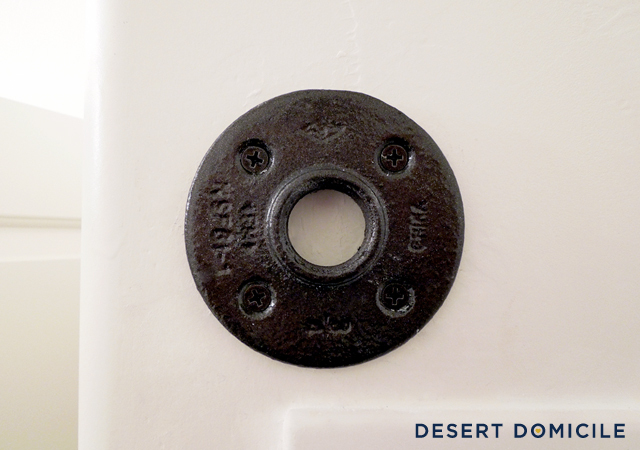 To hang my curtain rod, I eyeballed where I thought it should go, held one of the floor flanges up on the wall and marked where the holes needed to be. Then I drilled pilot holes and repeated the same measuring/marking process for the other flange on the opposite wall. 7. 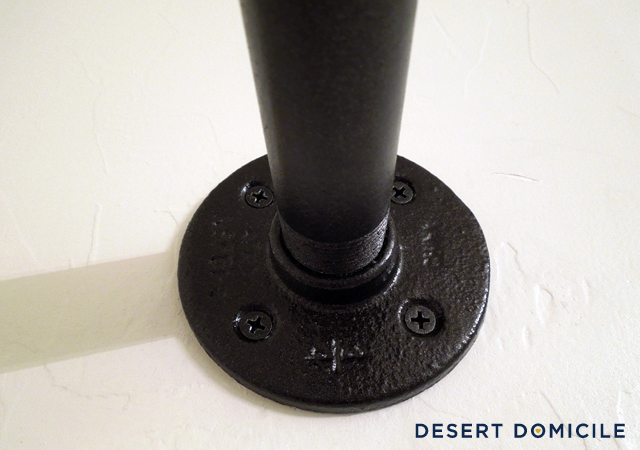 Assemble the shower curtain rod by twisting each floor flange onto the threaded ends of the pipe. 8. Find another person who can hold the pipe rod up while you screw the floor flanges into the wall (preferably into a stud since the pipe is kind of heavy). What do you think? Am I the only one whose shower curtain rod jumps off the wall? 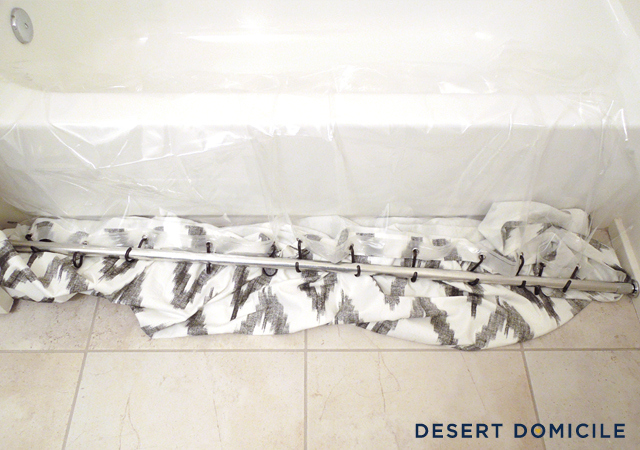 Disclaimer: I can't guarantee that your shower curtain rod will turn out just like mine. Differences in materials and tools used, and your skill level, will yield different results. I cannot be held responsible for a failed project or an injury of any kind so proceed with caution and build at your own risk. Remember: always use caution when working with power tools and read any instructions before beginning any project. Thanks Nancy! Pipes are so versatile, aren't they? I'm already thinking of other projects to use them in! 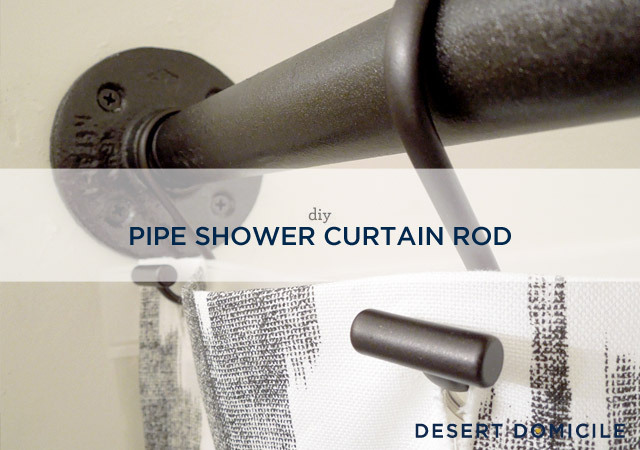 I grew up with this same pipe shower curtain rod, since my dad was the one that did everything himself. Thought I would croak when I rented an apartment and they had the stupid twist ones that never seemed to stay up. I changed them out myself and the apartment complex's (plural) never noticed or even knew about it, less they noticed after I moved out. One question. Was it tricky getting the length of the iron pipe just right? After all, it needs to be slightly shorter than the distance between the two opposite walls. But at the same time, it needs to be within the range of play offered by the two pipe flanges at the ends. I've never actually worked with iron pipe fittings before and was wondering about how much latitude the threaded portion of the two flanges offered you. I'd be curious to hear anything you have to say about that. Also, seems like this would be a great way to make a chin up/pull up bar on the cheap. The pipe is bound to be pretty strong. Wonder how strong the pipe flanges are? I guess I wouldn't want to hang upside down on it. But as long as one was in a heads up position, even if a flange gave way one would merely land on one's feet. I actually have a pipe like this in my shower, which was there when we moved in. Soo much better than the twist rods. However, I have been dying to spray paint it copper to go along with my decor. I haven't though because I'm nervous that the shower curtain hangers will scrape off the spray paint. Have you had this happen at all or is it holding up well? Thanks Jenna! 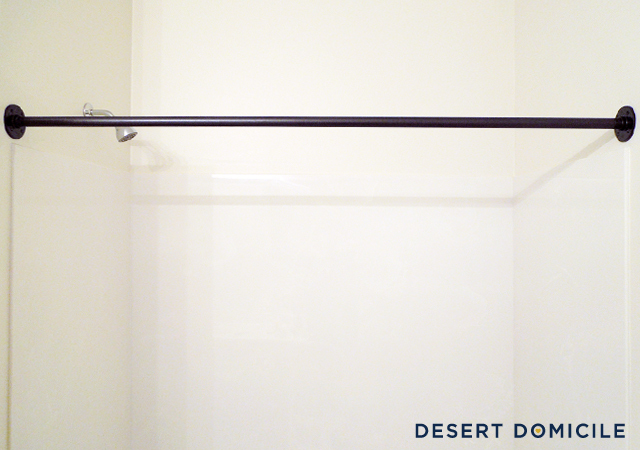 The shower curtain rod is in our guest bathroom so it doesn't get a lot of regular use, unfortunately. We do open and close the shower curtain a lot though to clean the bathtub and what not and I haven't noticed any scratched paint! If you do decide to spray paint yours, I'd wait a few days before hanging the rings back on it just to give the paint enough time to cure. Hope that helps! Beautiful! I love it:) Can I ask where you got your shower curtain? Oh wow, we have the same shower curtain. Didn't know that! 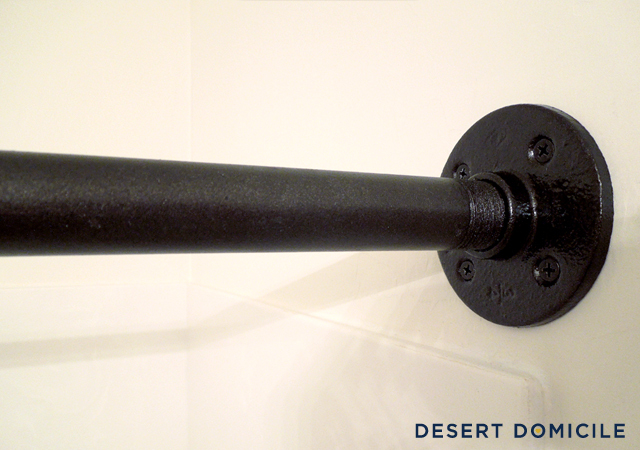 Looks great -- considering something like this to replace a rusty steel shower rail, but is the spray paint waterproof? Is the paint is going to peel off and the iron bar rust in damp conditions in a shower?